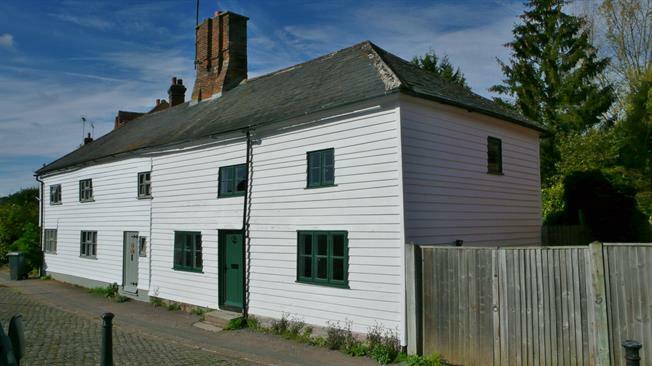 2 Bedroom Semi Detached Cottage For Sale in Robertsbridge for Guide Price £350,000. The property offers spacious accommodation with a wealth of original features spanning over 500 years. The front door opens to the living room, with its impressive inglenook fireplace, double aspect windows and timber walling through which doorways lead to both kitchen and dining room. The kitchen offers fitted units and shelves with oak worktops, and access to the garden. The dining room has a brick floor and original chestnut stud and lime plastered wall. The 17th Century oak and elm stair rises to the first floor, where the spacious master bedroom displays its original beams and rafters, brick fireplace, double aspect windows and waxed timber floors. The second bedroom has double aspect windows, exposed oak framing and a loft hatch accessing a large roof space. The good sized, well-appointed bathroom has a traditional white suite and exposed beams. Externally, to the side of the property timber gates provide access to a side yard, which in turn leads to the rear paved terrace. The large garden beyond gives the property a large external area reflecting the scale of the house.